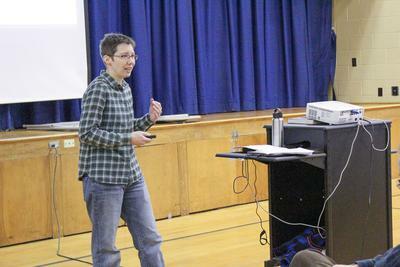 Elizabeth Leclerc gives a presentation about the comprehensive planning process starting in Penobscot at Penobscot Community School on January 19. Photo by Monique Labbe Order prints of selected PBP photos. The last time the town of Penobscot put together a comprehensive plan was in 1997, and now, over 20 years later, it is time for another one. This is according to Elizabeth Leclerc, who is leading the charge in developing a new comprehensive plan that will study the current and future needs of the town. Leclerc gave a presentation to a crowd of about 20 at the Penobscot Community School on January 19, and discussed what the intensive process will consist of, and who will be needed in the development of the plan. The presentation, as well as other information about the comprehensive planning process is available at the town website penobscotmaine.org. The comprehensive planning committee is currently made up of Leclerc and John Albrecht, but Leclerc said they are looking to form an official committee of 11 to 15 people. That committee would meet once or twice a month, and work in tandem with community work groups that will be formed to tackle specific areas of research, including archaeology and history, housing, marine resources, population and demographics, existing land use, and many others. Leclerc said it is “highly important” to have input from “every walk of life” in town, and to include everyone from business owners to town officials, full- and part-time residents, parents, etc. “We really want this to be something for the town, by the town, and the only way to do that is to have as many people as possible involved,” said Leclerc. The goal is to have about three to six people per work group, with the bulk of that work to come during the early months of the planning process. Maggie Williams asked about the possibility of hiring a consultant to take on the comprehensive planning process, which would have a cost attached to it but could be a faster way of putting it all together, as Leclerc pointed out in her presentation. Leclerc said that hiring a consultant to take on the entire project would cost about $16,000. There will be a warrant article at the upcoming town meeting in March to ask for some funding for the comprehensive plan should the committee feel they need it; however, Leclerc said that doing it as an “in house” project would allow the townspeople to have the most input. Those interested in being part of the comprehensive planning process can contact the committee at penobscotplan@gmail.com, or Leclerc at elleclerc@gmail.com. Would-be volunteers wishing to be on a committee or assist in the process can fill out a contact form at the town office, and a member of the committee will be in touch.